The scenic view of Nice in Provence, France as seen from the Parc du Chateau shows both the old and new towns as well as the waterfront. 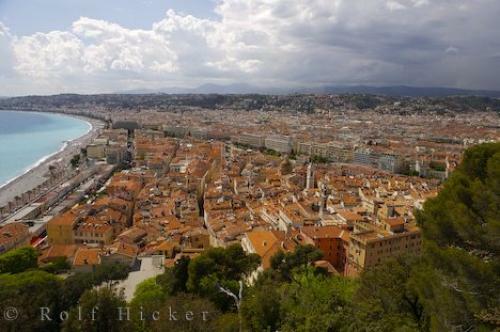 Photo of the scenic view of city of Nice, Provence in France, Europe from the Parc de Chateau. ... by the sparkling, blue Mediterranean Sea it is easy to see why Nice has attracted the rich and famous and the bourgeoisie for years, even Queen Victoria enjoyed the charm of Nice.The Old Town of Nice, Provence has much to offer, the Cours Saleya, an outstanding food and flower market, the Cathedrale Sainte Reparate in the Place Rossetti, and numerous charming shops, restaurants and sidewalk cafes can be found along the fascinating streets, such as the Rue du Marche and the Rue de la Prefecture.Along the seafront, the Baie des Anges stretches for over 7 kilometers, unfortunately there is little sand, but the gravel is smooth and the beach is divided into private (for hotel customers) and public areas for bathing.Nice in Provence is probably the best city to visit on the French Riviera on the Cote d'Azur. It has charm and character and visitors can find either peace or excitement, whatever their preference.City of Nice waterfront and Old Town seen from the Parc du Chateau, Riviera, Provence, Cote d'Azur, France, Europe.